This write up of one of my Cold War Road Trips is slightly out of sync as this was the 3rd of my adventures. The 1st and 2nd will follow at a later date. 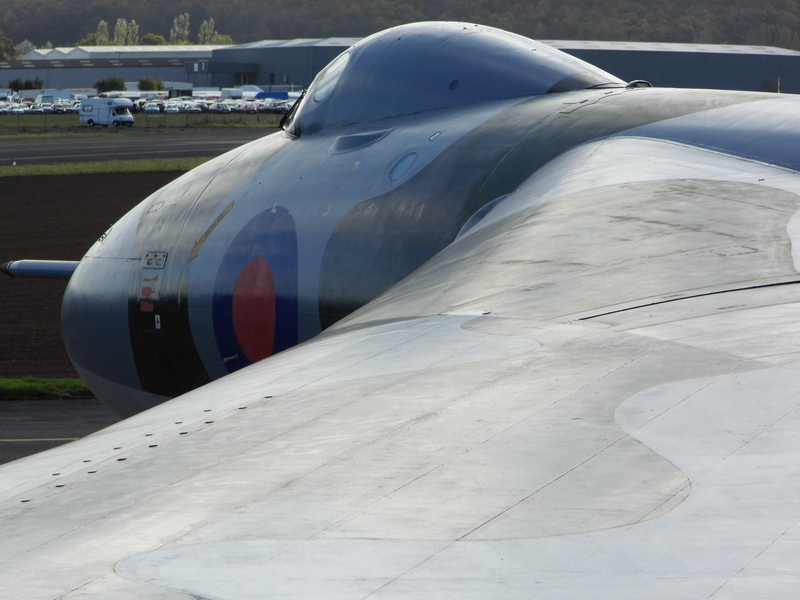 One will be a tour of what was RAF/USAF Greenham Common and the other will be a visit to Avro Vulcan Mk B2 XL426, now at Southend Airport and the original RAF Vulcan Display Flight Delta Lady during one of her open days in 2011. 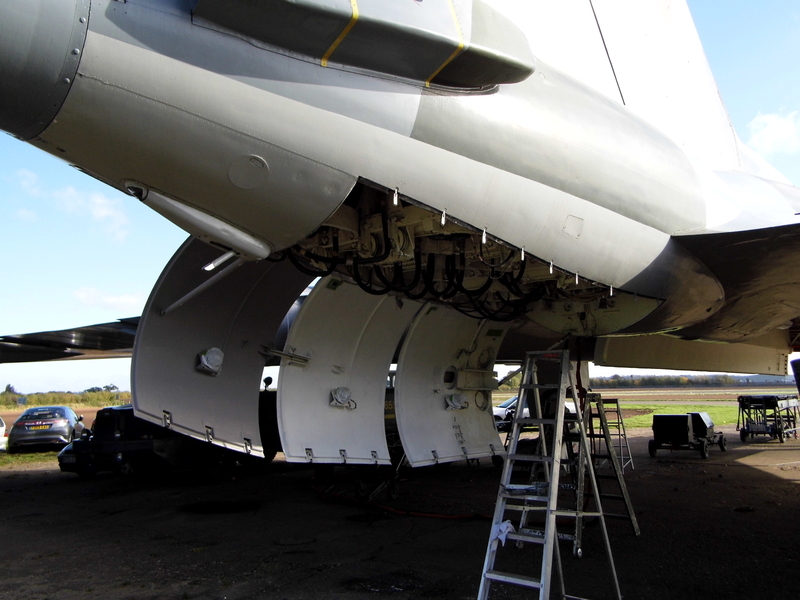 I Hope that you enjoy my recollections of the day of my time spent with XM655, Dave Taylor (@XM655), Charles Brimson (@ramshornvortex) and the rest of the volunteers who do a most fantastic job of keeping this wonderful lady alive and breathing. 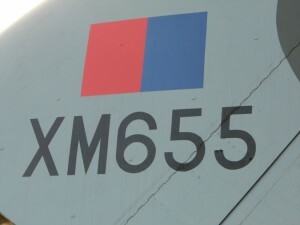 If you enjoy this blog why not visit www.XM655.com for all you need to know about this fantastic plane and the group of volunteers who keep her ALIVE. 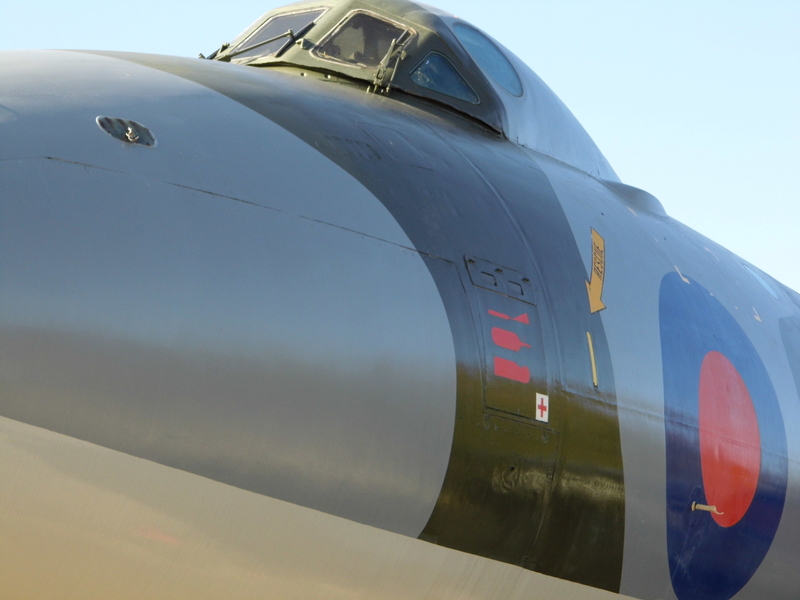 It was an early morning start on a lovely clear blue sky morning in West Berkshire as I began my ‘Cold War Road Trip’ No3 (as they have been christened) up to Wellesbourne in Warwickshire, home to the world’s most powerful Avro Vulcan Mk B2 XM655. The journey was to be taken via train so as I travelled, I was taking note of various places of interest and tweeting my progress. 1st was the Water Tower at Ex RAF/USAF Greenham Common to the South, shortly followed by the towers of AWE Aldermaston and the cranes at AWE Burghfield. A quick change of trains then quickly passing the Rutherford Laboratories at AWE Harwell. Now you may understand why people who live in my part of the country know it sweetly as ‘The Nuclear Triangle’. 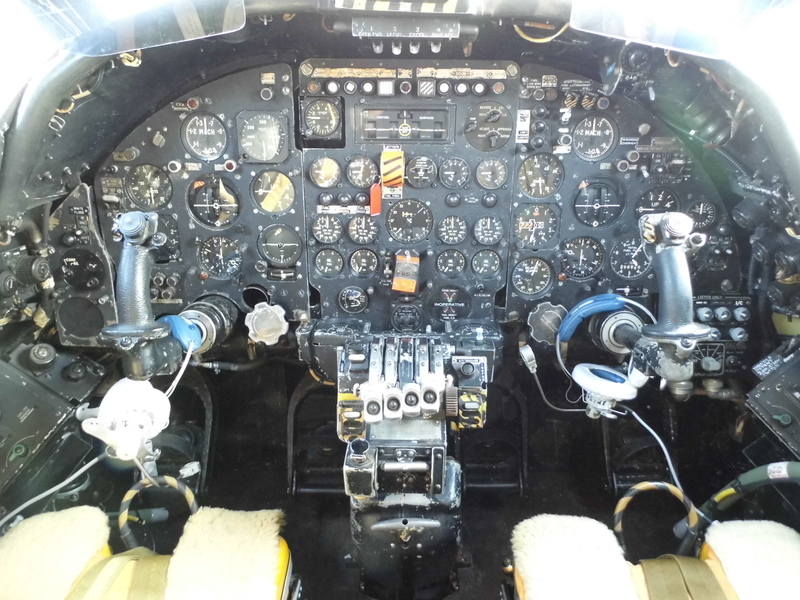 Leamington Spa was soon upon me where I met up with fellow enthusiast and XM655 Volunteer Dave Taylor and Sam and soon we were on our way to spend the day with one of the ‘Other Ladies in my Life’. 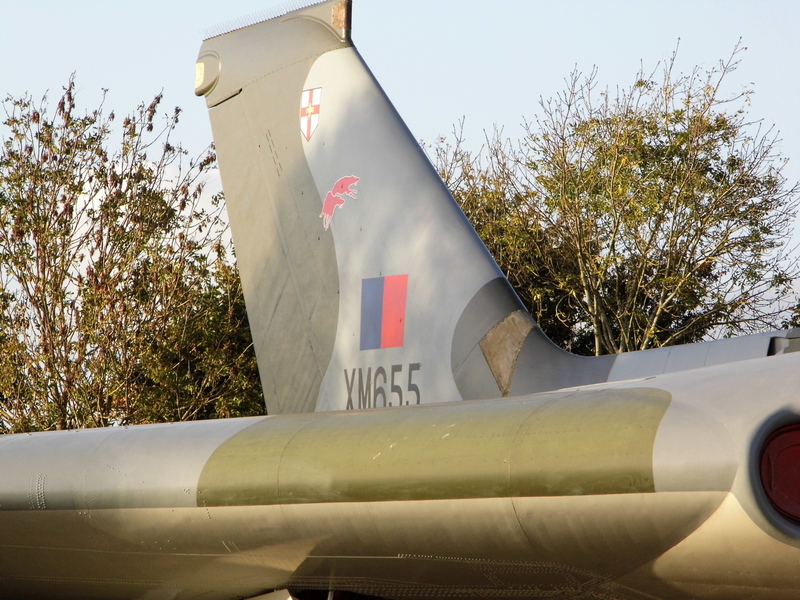 They always say that 1st impressions last and to this when seeing XM655 for the 1st time, over the hedge tops in the distance, her massive tail fin glinting in the morning rays of sunshine I wholly agree. For the 1st time in a long while I was speechless. There, right in front of me was a real icon of British Engineering at its pinnacle and I would be her guest for the day. Out of the car and camera around neck we hurriedly walked around the back of the little flying school, through a small gate and there she was AVRO VULCAN Mk B2 XM655, regally standing on her hard pan, crew door already open, Electronic Counter Measures (ECM) Bays latched open with step ladders reaching up upon which a volunteer was busy applying a coat of paint to the inside. Volunteers cars and the Tug were parked in the distance with the Houchin already placed under the port wing with various cables linking up to the War Bird . Behind her ECM stood a row of containers with various door open with people in green overalls walking too and fro collecting various objects. A cry call out for ‘Who’s having Tea’ to which a varied reply of ‘Yes please’, ‘Aye’ and 2 sugars no milk were heard. I was later to find out that they all have their own personal XM655 mugs with how they take their tea printed on the side (now that’s clever). I stuck my head into the container where most of the volunteers had gathered, there was the tea urn, the biggest homemade cake that I have ever seen. A hot tea was thrust into my hand and then back outside. Dave introduced me to Charles Brimson who gave me a quick rundown on the order of the day, telling me of the various procedures that they were going to run. The little Flying School next to XM655 now came alive with comings and goings and I took my 1st tentative walk under the Delta Wings camera clicking away, the Squadron Badges on the Nose wheel Undercarriage Door, Inflight Refuelling Probe, Bomb Aimers Window, Terrain Following Radar Housing, Skybolt Missile Hard points. 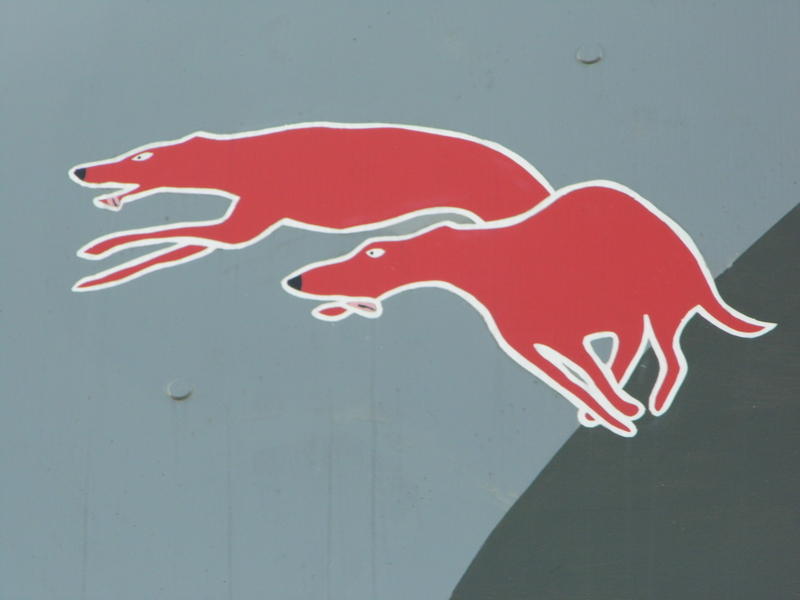 “Mind your head on that ECM Antenna” comes a shout from behind. So much to see and take in I did not know where to look next. Back to the rear of the plane and those End Caps from the jet pipes, the ‘dingo’s’ on the Tailfin, then things started happening. Charles came up and informed me that they were training new people on start-up procedures and could I stand back for a while. The Crew Chief arrived and plugged himself in and then Charles, Len, Damaris and one other volunteer climbed into the crew compartment. The Houchin was fired up and the smell of diesel permeated the air. 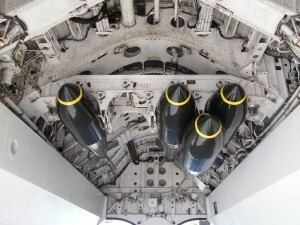 I disappeared into one of the containers and there was one of the ‘fake’ 1000lb’ers that had been made for the recently acquired Bomb Bay Rig. Imagine 21 of those being unleashed on Stanley Airfield I thought!. The team climb down from the plane and head for the tea urn, all except Len who pulled me to one side and asked if I wanted a slightly different view. 10 seconds later I was stood on top of a set of steps along with Len looking down onto the port wing at about level height with her serial number on the Tail Fin. I can only remember one thing that Len said to me and that was ‘You don’t often get the chance to see her like this’. I think that his words are enough. 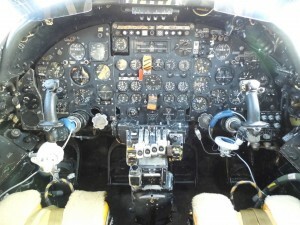 (Len worked for many years on the Vulcan in avionics). Back on terra firma and meet up with Dave who gave me a tour and explained various things like the different aerials on top of the fuselage and various other parts of the ECM system, then it was our turn. Len returned and informed us that we were to have an ‘all the trimmings’ tour of the Crew Compartment. Like a rat up a drainpipe I was gone and halfway up the ladder, albeit behind Sam who had beaten me to the chase. 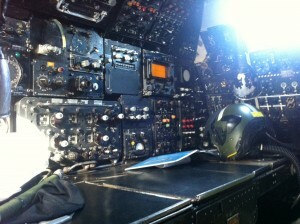 Len placed himself in the Nav Radars Position, Sam in the Nav Plotters with myself positioned in the AEO’s seat. Dave stood behind me. Then the smell of this V Force bomber hit me like Henry Cooper landing his fist on Ali’s jaw. Its something everyone should experience, it’s indescribable. Len began with the abandon plane routine. If my memory serves me right, I’m out first followed by Len and finally Sam, bless her but I’m only following orders, then again if the Nose wheel is down I’ll be a nice cushion for the rest to fall on to, though a bit messy. Then onto the serious business on how all of these banks of dials, switches and screens work. Len is in his element providing in-depth details on the workings of nearly every single piece in the back office from the Tracking Display Unit, Navigation Bombing System, Heading Reference System and many many more. I could see in Len’s eyes that he knew that he had us fixated and hanging on his every word, and he had! Time for the front office. Len deftly shins up the ladder and plants himself in the Left Hand seat, Sam follows and hits the Right Hand seat and I clamber halfway up the ladder, peering through the middle at the flight controls and those 2 fighter style sticks, and realising that you can’t see much from out of those windows. My imagination takes over and for a split second I can see R.J ‘Roly’ Falk – Avro Cheif Test Pilot in his Grey Pinstripe suit sitting there and planning his famous barrel roll at Farnborough. I return from my thoughts. The sequence begins again with Len starting in the pilot’s seat talking through the start-up procedure and checklists, engine dials for oil pressure etc. 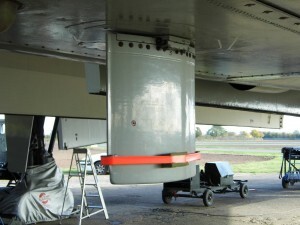 The Central Consul comes out and a detailed insight into inflight refuelling, moving fuel around between the fuel bays to keep the plane stable ensues. Right Hand seat description commences and what seems like a flash the tour is over. We climb back down and out of the aircraft and only at that time did I realise that we had been inside for just on 1hr. Top stuff Len, what an asset. ‘Tea’s up’ comes the cry once again and we retire to the container, some of us staying inside, others walking a safe distance from the plane to enjoy a cigarette. The chocolate biscuits that I gifted earlier were now ceremoniously opened and those who do chocolate biscuit certainly did some damage. Charles came back over and announced that they were planning to do another start up procedure in a short while and would I like to see all of the outer working moving like the Bomb Bay, Elevons etc or would I like to go inside whilst they carried out this process. Now, put yourself in my shoes. Do I stay outside or do I go in…………………………………………….? ’I’M IN’ came the answer without any hesitation. The next 15 minutes seemed like an eternity, I start to pace, 1st slowly then at a rapid speed. My palms getting sticky and starting to shake. ‘I’m going in a Vulcan Bomber and they are going to perform a start-up routine’. Charles returns from a container with 2 pairs of headphone, beckons myself and Dave over and up we go. Len and Damaris are already occupying the Pilot’s & Co pilots seats, I’m offered the Nav Radars seat with Dave once again standing /sitting behind. Charles is last into the plane and plugs in the 2 sets of headphones, giving one to myself and the other to Dave. He then places himself into the AEO’s position and puts on his ‘Bone Dome’. Then we begin. Once again we are given the escape routine, though this time serious as we will be in a live aircraft. Dave’s out first followed by me then Charles who guarantees that he will break my fingers by treading on them on the ladder if I’m too slow, a small price to pay me thinks. All of a sudden various conversation are taking place between Len & Charles, Charles and the Crew Chief, Len & Damaris. Then we hear ‘and what about you two chaps’ in our ears. All me and Dave can do is raise our clenched thumbs and wear cheesy grins. ‘They’re OK, replies Charles over the radio. The Houchin once again fires up and then Charles is in his element, his hands gliding over the dials like a classically trained pianist whilst I watch agog as lights flash and flicker. 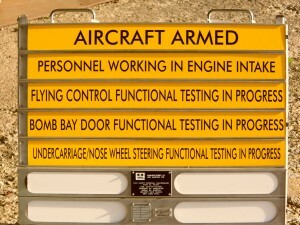 ’Time to test the speed of the Bomb Bay opening’, ‘roger that’ . All eyes look at various styles of watches, counting the seconds go by……23, 24, 25, 26. ‘Not bad, though could be faster, let’s try it again. 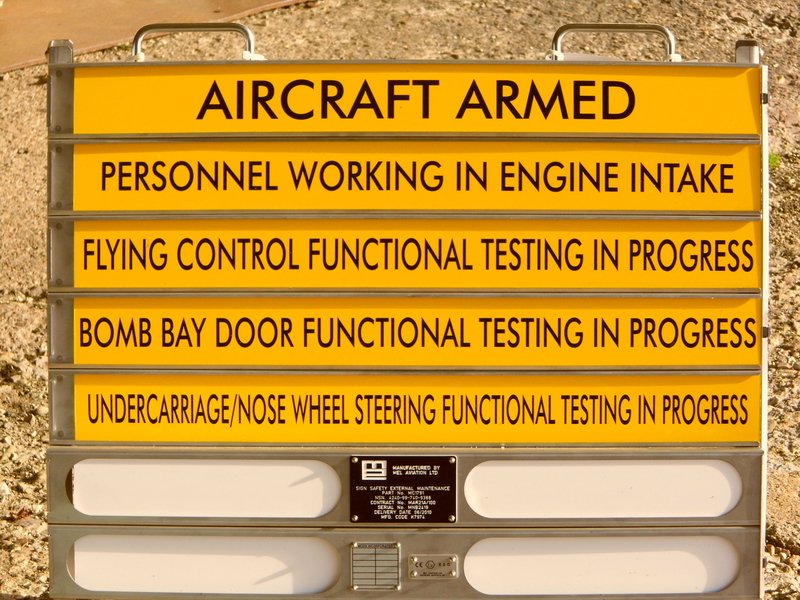 The Crew Chief answers shortly after ‘Bomb Bays doors shut, over to you’, ‘Roger that’ replies Charles ‘Doors opening in 5, 4, 3, 2, 1……………………………………16, 17, 18, 19 that’s better’. ‘Right, shut down procedure commencing’ and it’s over. Now, as you may have guessed, I cannot remember much of what was said because probably like you would have been, I was just awestruck with the experience, an experience that I will never forget though hopefully I will be able to experience again one day. I take one final last intake of ‘Vulcan Perfume’ through my nostrils unclip my earphones and disembark, hitting that pan my legs feel like jelly. That really was the ‘VULCAN EFFECT’. 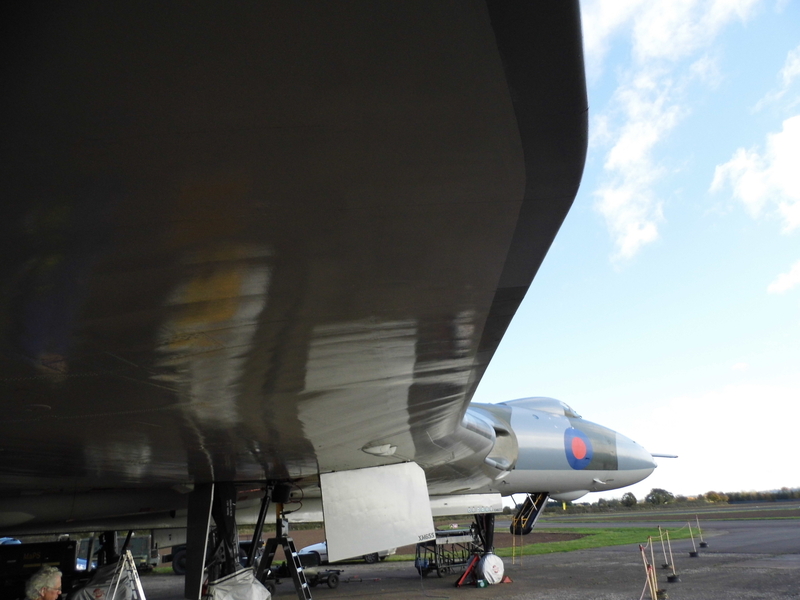 By now the light is starting to falter and I take to opportunity to take some ‘mood’ pictures of the sun through the trees casting dappled shadows onto the fuselage of this living, breathing Vulcan. I really do not want to leave, but I have trains to catch, photographs to download, twitter to update so I make a play to the gaggle of remaining volunteers who are taking a quick breather before they close her down and tuck her up for the night. I thank as many as I can before we make our way back to the waiting car and the short drive back to Leamington Spa for my departing train and then home, exhausted in body, but mentally ‘electrified’. One of the outcomes of this visit was the website that you are now looking at and the twitterfeed that you may follow. Further things may happen in the future, however, it may mean another visit to AVRO VULCAN Mk B2 XM655. Thanks Rod as always. Keeping the force alive! Loved it, thanks for sharing! good ole 655 -shame about the sh*gg*n dingoes on the fin- should have a 101 Sqdn badge there ! when the vulcans started on red flag [ did the first one to nellis- what a gas] the only way to get bombs to the usa was to use vulcans. For the first time in many years two bomb carriers were mounted on stations 2 and 3 complete with 14 live bombs- did the u/c creak or what and the take off weight was the highest for many a year. Imagine a 98% +8k fuel plus 14k of bombs and a bit more runway than normal was needed. Later after the Falklands I was stationed at RAF Stanley for a while- as it was only a couple of years after the war the bomb craters were still evident around the airfield. Had the Junta not started the war when they did the Argentine AF could have been flying Vulcans as a military delegation came to St Athan just before the major serv line shut down to discuss the purchase of a dozen bombers plus spares, training and a major for each aircraft at saints before departing to latin america- it was a close thing ! kev ex Waddo line and the 101st fleet of foot- we can run away faster than anybody !